My interest in the Reggio Emilia approach to education began when I was in undergrad. 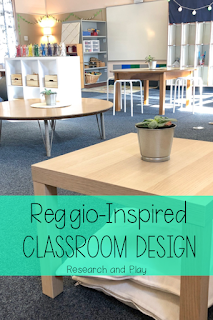 Learning about the physical environment in Reggio spaces was my favorite part, and I knew that one day I wanted to design my classroom based on the tenants of a Reggio space. However, the reality of getting hired 4 days before the school year started kept me from designing my dream Reggio space. I went crazy at the local teacher supply store and decked my room out in Dots on Turquoise everything! It looked nothing like I imagined, so I knew I had a lot of room for growth. Fast forward to living in Colorado and having much more time to plan, and I was finally able to incorporate more Reggio influences into my space. I brought in more natural materials, took down a lot of my borders and posters, and created more cozy nooks. It was close, but there was still more I could've done. Another move and another classroom later, and I am finally able to realize my Reggio design dreams. I've been in this classroom for almost 5 years now, so bear in mind that this design did not come overnight or even in one year. I had to live in this space for a while before I could truly re-imagine it as a Reggio-inspired classroom. What you see now is still just part of my vision for this space, but it's coming together. I want to share my strategies and tips for incorporating Reggio-inspired design into your classroom in both small and big ways. Although I've been in 3 classrooms so far, my transition to this current design stems from the way I set up all of my spaces throughout the years. I want to show you the phases of this design so you can see some very small ways to incorporate Reggio-inspired design into your space. You'll see how my classrooms looked very different, but in each one I tried to incorporate some pieces of a Reggio-inspired environment. Make sure you use as many neutral, natural accents as possible. Think brown (yes, brown) bulletin board paper, green or blue table caddies, and borders with little to no design on them. Ask family/friends if they have any old throw pillows they aren't using anymore. You can easily create a cozy reading nook with some pillows. Same goes for rugs, ask around for those, too! If you're allowed to bring in lamps (not everyone is), add a couple. Put one near the entrance and one near your reading nook. Hopefully you have some sort of natural light, so keep your lights off for at least one part of your day to enjoy the sun and lamp light. If you can't really incorporate play centers in the morning and instead have to have work on the tables for the kids, have piano or classical music playing quietly as students come in. Make sure the kids' names and/or pictures go up somewhere within the first week of school. You can even ask families to bring in a family photo so you can display it on a board or other space in your room. It turns a cold room into a more cozy one just with those personal touches. Create areas that serve explicit purposes. 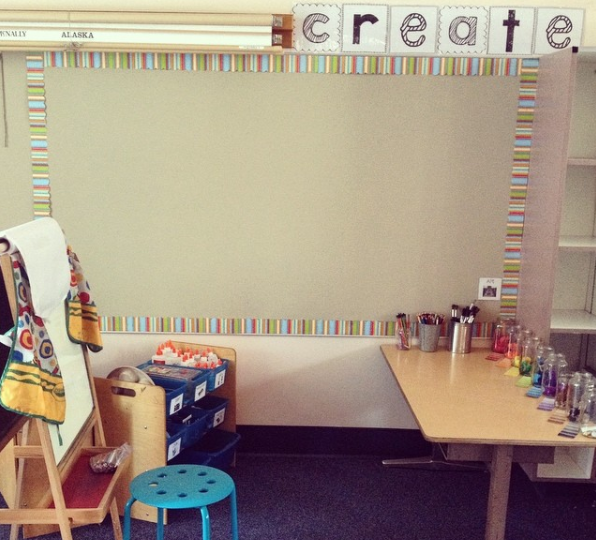 Have an art table, loose parts area, kitchen/dramatic play area (if you can), and a reading nook. Make the reading space cozy, a place children can literally curl up with with a book. Let students help you design the things that are hanging up, like the number line, word wall, or class rules. Create your own signs instead of buying posters or premade ones at a store. Start to use real-world materials for learning experiences. Bring stones, rocks, buttons, or other items for math, for example. Make supplies easily accessible for students. Use baskets to store things so they are more easily seen. Remember colors. 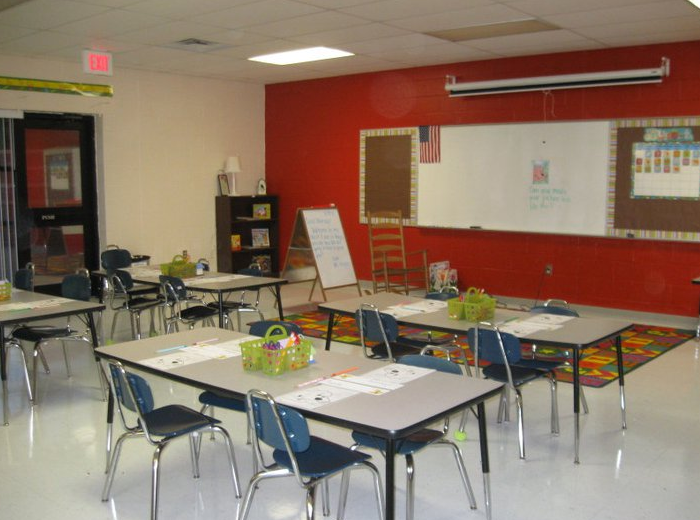 Both cool and warm colors have a place in the classroom. Choose one set of colors and stick with it, mixing lots of cool and warm colors together could be overwhelming. Start to experiment with flexible seating. Removing chairs goes a long way in changing the dynamic of the space. You don't need a lot of options, just a few things to sit on besides chairs. If you do not have a kitchen set in your classroom, don't be afraid to ask your principal or PTA to help you get one. You could also get lucky at garage sales or on Craigslist. If an admin is hesitant to bring a kitchen set into your room, explain the research behind the benefit of play. You can't argue with research! Take out some furniture. 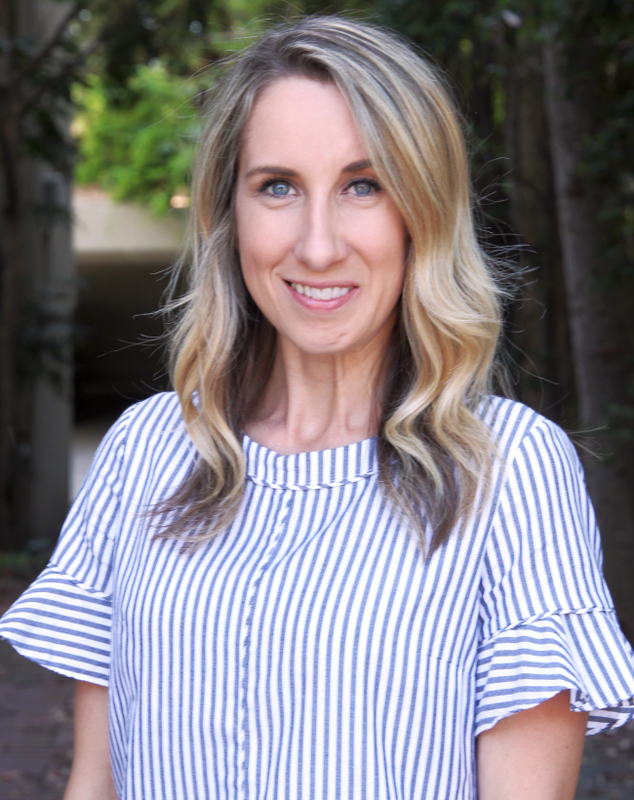 In a Reggio-inspired space, there doesn't have to be a seat at a table for each child because the children are up and moving around, completing tasks and working at different rates. Students are also encouraged to find a space to work that's most comfortable to them, and that won't always be at a table in a chair. I have no chairs currently, but you can leave some in your space. Without so much furniture, my students have so much more space to move around. Add more visually-beautiful design elements that also serve a purpose. The white shelving in the middle of my room is our supply hub, the place where my students go to get any kind of work supply they may need during the day. It's also a statement piece in our room and where your eye is drawn when you walk in. It uses natural materials and colors like the white shelves, wooden boxes, and glass jars. It incorporates color but in an understated way. Incorporate natural light. Open up all of the blinds and invite sunlight in. Use string lights, table lamps, salt lamps, or essential oil diffusers that light up. Resist the urge to always have on your overhead lights. Lighting plays a huge role in the coziness of a space. Remove unnecessary objects and bring in natural ones. I no longer needed a table caddy for each table, so I took them out and brought in succulents. We also have other plants in our classroom now, and my students help me take care of them. Bringing in plants is a great way to make a space feel more natural, less like a sterile classroom. Plants are also natural air purifiers! 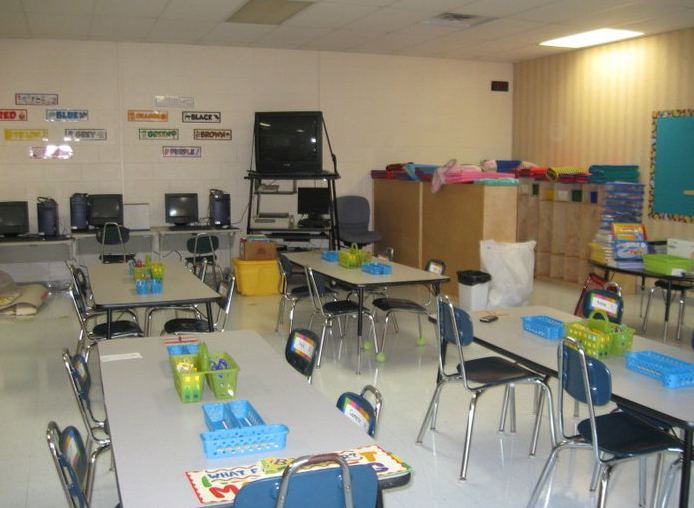 Reject traditionally-designed classroom spaces. You don't need half of the things you think you do or what you see on social media. If you wouldn't have it in your living room, it probably doesn't belong in your classroom. The idea is that your space feels welcoming, inviting, and calm. If you'd like to know where any of the items are from, please comment and I'll get you links if I can! Yes they are! They're the LACK tables. I've found that you can't always find things on the website that you can find in store, especially the natural wood finish of these tables!